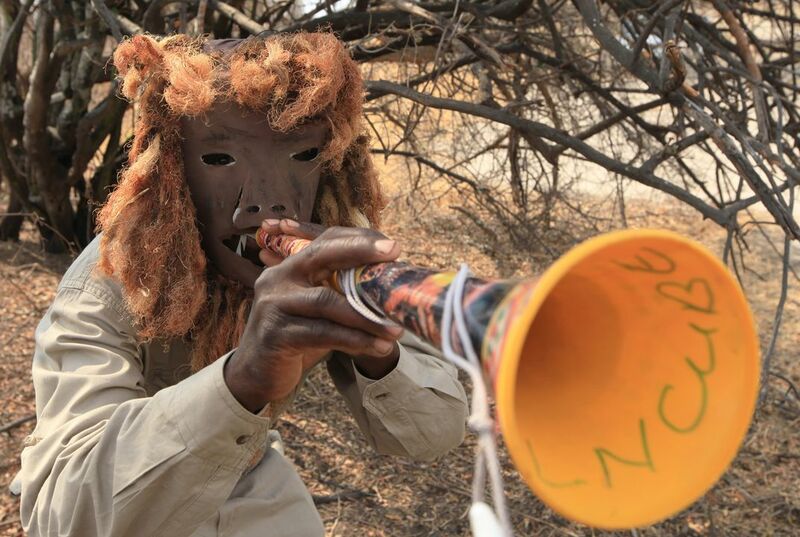 Standing 20 feet from a lion, Charles Tshuma was armed with just a plastic horn. It is called a vuvuzela. He and some neighbors blew the vuvuzelas to frighten away a lion. But the big cat did not budge. They kept blowing their horns and shouting and screaming. Finally, the lion turned away and ambled back into Hwange National Park. The big cat was leaving Tshuma's rural community. It's not always so easy, said Tshuma. Sometimes people in the village do not want to join in to chase away the lions and choose to lock themselves indoors, he said. That is the life of Zimbabwe's lion guards. They are brave community members. Each is selected and trained to prevent attacks on humans and cattle by the big cats. The lions stray from the unfenced Hwange Park. The park sprawls over 5,625 square miles. It is in western Zimbabwe. The country is in Africa. The killing of Cecil the lion by an American hunter near Hwange Park in July caused worldwide outrage. But the biggest threat to Hwange's more than 500 lions is conflict with surrounding cattle farmers. That is according to researchers. The innovative lion guard program is designed to protect both humans and lions. Oxford University's Lions Research Project has tracked and studied over 30 lion prides (families). The research project has been working for 15 years. Oxford is in England. Seeing many attacks by lions wandering out of the park, the researchers in 2007 launched the Long Shields program. Its goal is to reduce conflicts between lions and humans. Since then, there has been a 40 percent decline in those conflicts. That is according to Brent Stapelkamp. He is a researcher with the Oxford project. 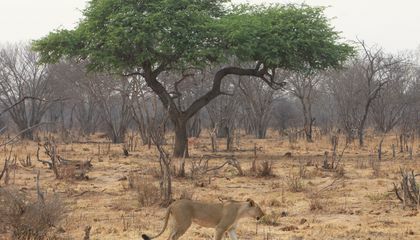 Many of Hwange's lions have collars with satellite tracking devices. So the researchers can inform surrounding villages when and where lions have left the park. The lion guards are equipped with mountain bikes, mobile phones and a GPS tracker. The guards go to the area to turn back the straying lions. They blow their vuvuzelas. And they alert other members of the community. People then gather. They carry whips and sticks. Some wear lion-like masks. They play drums and clap wooden blocks together. The idea is to scare away the lions. The people also use bright lights and light watch fires at night. The name Long Shields refers to the Matabele warriors of the late 19th century. They were known as "the people of the long shields," for the tall rawhide shields they carried into battle. Even though there's an average of 30 lions-human conflicts per month, communities surrounding Hwange have seen a decline in lions attacking cattle. "We definitely know that the program has actually been able to chase some lions from the community back into the park. So in that way it becomes effective," said Lovelater Sedede, a parks ecologist, but she warns: "Lions running away from the sound of vuvuzelas do not totally eliminate the problem. Lions could get used to it and hence there is need for more research methods to fight lion and human conflict." The surrounding communities are pleased with the results. "We have noticed that the challenges from predators have gone down ... our animals are protected and the predators are kept away," said Vincent Mangenyo, a local leader. Forty percent of the deaths of lions in the Oxford study are at the hands of livestock owners or as a result of their attacks on livestock, said Stapelkamp. Those represent the single biggest cause of lions' death. "I can't ... tell the world that lions are the most important thing in the world and we must conserve them," he said. "I can't, because there are people who are hungry, starving in Zimbabwe. They lose all their livestock to a lion in a night." But thanks to the Long Shield guards, not only are livestock saved, noted Stapelkamp, so are lions. Why is scaring off the lions the best defense? I think that it is kind of scary to be a lion guard because some people are brave enough to be a lion guard while most of the people are scared of the lion because I think that the lion is going to hurt them. Being a lion guard is not going to be a safe idea because the lion might hurt the guard which is not going to be safe which some lions are still hostile to people who wanted them to be scared away. Critical Thinking Question: Why is scaring off the lions the best defense? Answer: Because scaring away a lion is the best defense because people wanted to protect their livestock to be eaten by the lion. I think this is cool because this is probably the safest way to ward off lions off the village. This is a great idea. I wonder who came up with this great idea. This is also a good way to protect lions without actually hurting them. Scaring off the lions is the best defense because it doesn't actually hurt them physically. Charles Tshuma is a brave man to fight with a lion. I can't even guard a lion. I would just run-away because I am scared. How do they protect themselves to the lions? I think one of the them will die, and the groups will not be happy about that. Why can't they let the police guard the lions. I have an idea, what if they split into groups. So, one group guards at night and second group at the day time. I would run-away from my group because I would be scared to be eaten. I would not be a good team member to guard the lions. That is scary. I don't think i can survive one day being a lion guard because I feel like i'm gonna get eaten. the idea of being a lion guard is good and bad. I think that because the guards are risking their lives. ALso the guards should be equipped with more weapons like guns because what if the lion just comes and attacks the guard. The guards should first blow the horn and if the lion comes they should shoot them. WOW! I never knew that a person would be brave enough to be a lion guard. But I am sure I don't want to be one. Maybe I will get hurt. SO I would never do it. But maybe when I grow up I will do it and maybe I will not. Scaring off lions is the best defense because there is no harm done to humans cattle or livestock. I chose this article because I think that being a lion guard in Zimbabwe would be a very interesting experience. Scaring the lions away instead of killing the lions is the best defense because it won't cause world wide outrage such as the killing of Cecil the lion by a hunter. Because you get to protect yourself and the SO SO SO SOOOOOOOOOO cute lions :3 MEOOOOOOOOWWWWWW!